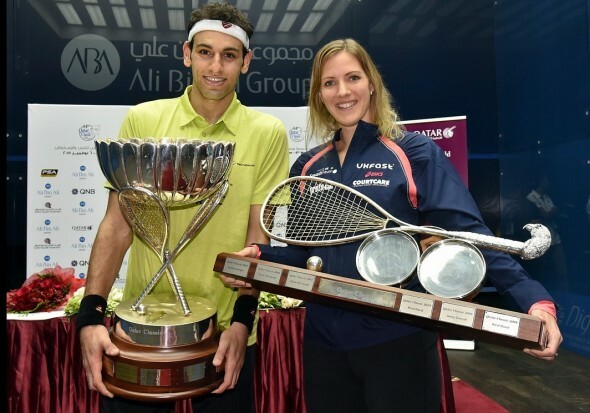 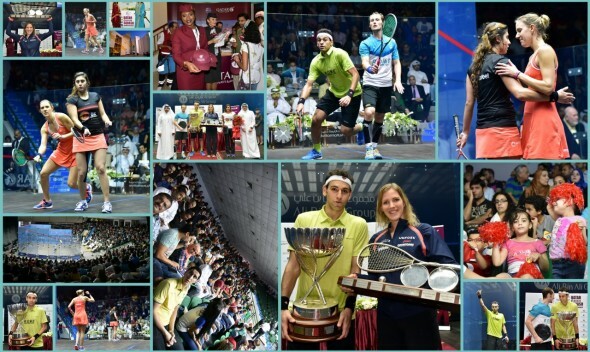 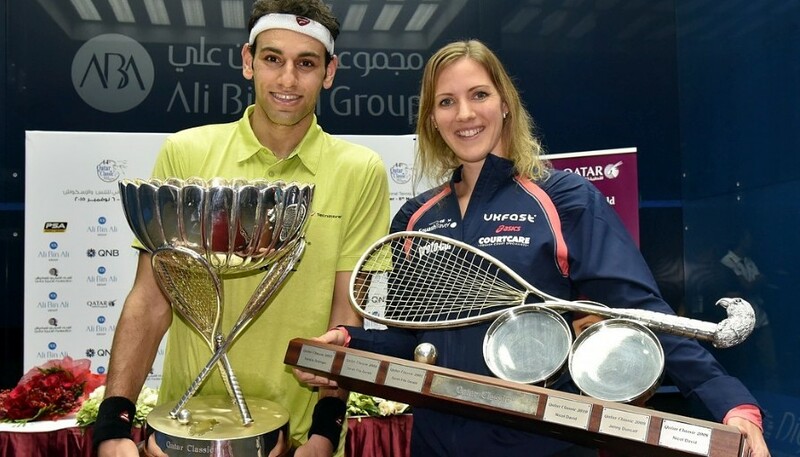 Egyptian Men’s World No.1 Mohamed Elshorbagy and England’s Women’s World No.3 Laura Massaro prevailed in their respective finals at the Khalifa Tennis and Squash Complex in Doha to become the 2015 Qatar Classic, PSA World Series tournament, champions. 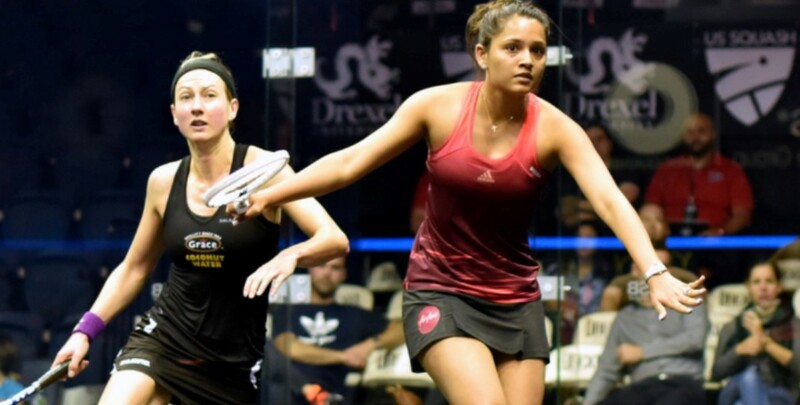 After triumphing at the first PSA World Series tournament of the season, the Delaware Investments U.S. Open, just two weeks ago in Philadelphia Massaro, the 32-year-old from Preston, continued to enjoy the form-of-her life as she came through a breath-taking five-game 73 minute battle with Egypt’s Nour El Sherbini. 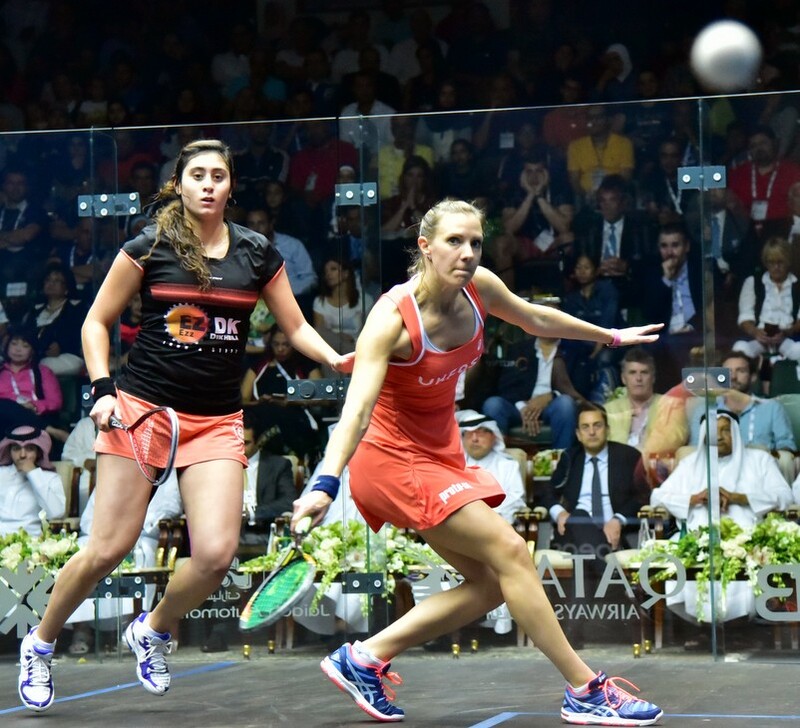 With the pairing sharing the first four games between them to force a title-decider it was the 20-year-old World No.8 who raced into an early lead before a succession of lets and strokes halted her rhythm and allowed Massaro to find her way back into the match. 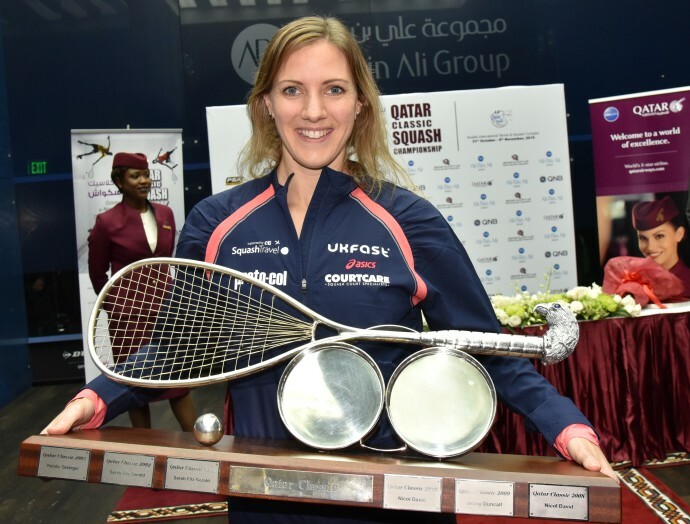 Massaro hit a delightful volley drop at championship ball to wrap up an enthralling 11-8, 12-14, 11-9, 8-11, 11-9 victory – a win that sees her strengthen her lead at the top of the PSA Road to Dubai Standings and cut down the gap between herself and Worlds No.1 and 2 Raneem El Welily and Nicol David, respectively. “There’s a lot of great names on that trophy so it’s a great feeling to know that my name will go along side them now,” said Massaro. 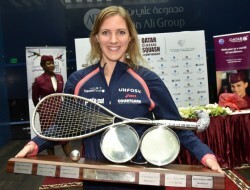 “It’s amazing to win another major trophy – I’m over the moon. 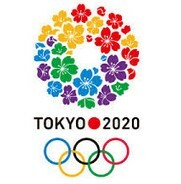 Physically and mentally I feel in a really good place at the moment. 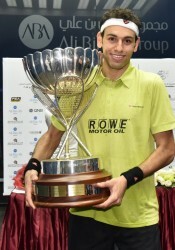 24-year-old Elshorbagy claimed a second consecutive Qatar Classic title with an assured 3-1 triumph over World No.3 Gregory Gaultier, to avenge his defeat against the Frenchman at the semi-final stage of the U.S. Open – a tournament Gaultier went on to win. Elshorbagy reached the final without dropping a single game all tournament and he capitalised on his freshness to pounce on a tired looking Gaultier, who had flirted with elimination against Karim Abdel Gawad in the quarter-final, recovering from a 2-0 deficit, and against Mazen Hesham in the semi-finals. 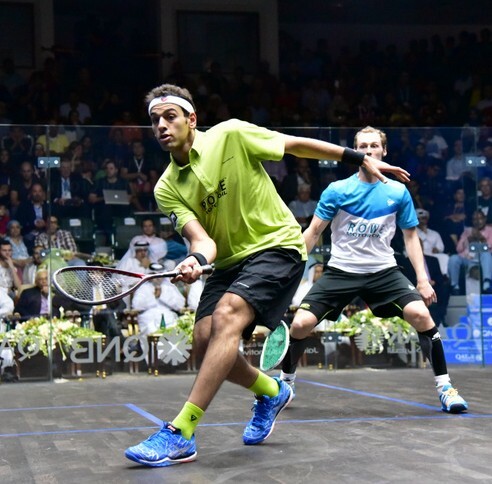 The victory now sees Elshorbagy go into the biggest tournament of the year, the PSA Men’s World Championship which begins on November 15 in Bellevue, Washington, approaching peak form. “This is my fourth year in a row to make it to the final in Qatar [2012 & 2014 World Championship, 2013 Qatar Classic],” said Elshorbagy.